All of the beautiful leaves have fallen from the trees. The hills are filled with the stark gray sticks of trees awaiting a long, cold winter. The Village is quiet and cars flow through the intersection of Routes 100 & 108 smoothly. A slushy mixture comes diagonally from the sky, coating the ground with the first frozen precipitation of the year. Why would anyone want to come to Stowe? It’s a good question, and yet lots of folks come up every year to experience our famous "Stick Season." But what’s so special about sleet and bare trees and a deserted village? Bargains, for starters. Many of Stowe’s great restaurants offer dinner deals to get people in the door. Without a crush of leaf peepers, restaurants still have to keep staffs busy until ski season picks up. 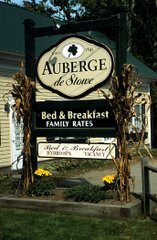 It’s no different here at the Auberge. Though we don’t have a staff to maintain, Chantal and I don’t mind seeing a little business during what is traditionally a down time. A couple of weeks to recover after foliage is fine, then we start to hope for guests to drop in. Accordingly, we drop our rates to the lowest of the season. All that makes "Stick Season" the best value of the year. Don’t get me wrong: Stowe is beautiful no matter what the season. On a sleety, slushy Saturday in early November I spotted a flatlander taking pictures of the Village. I thought to myself, "This guy’s crazy." Then I stopped, found a spot out of the wind, and watched him. I looked where he was pointing his camera and I realized that everything was still gorgeous...just in a different way. The woods are carpeted with a colorful array of wet leaves. The light is low in the sky. The wind is biting. The sun rarely makes an appearance. But it is all still beautiful. It’s one of the great things about living here. No two days are ever the same. And the beauty of this place is always just outside your door!